A new month and a new mystery. We’ll keep this short and sweet: What, exactly, are we seeing in this image? Leave your thoughts in the comments here, and we’ll be back on Tuesday with the answer. 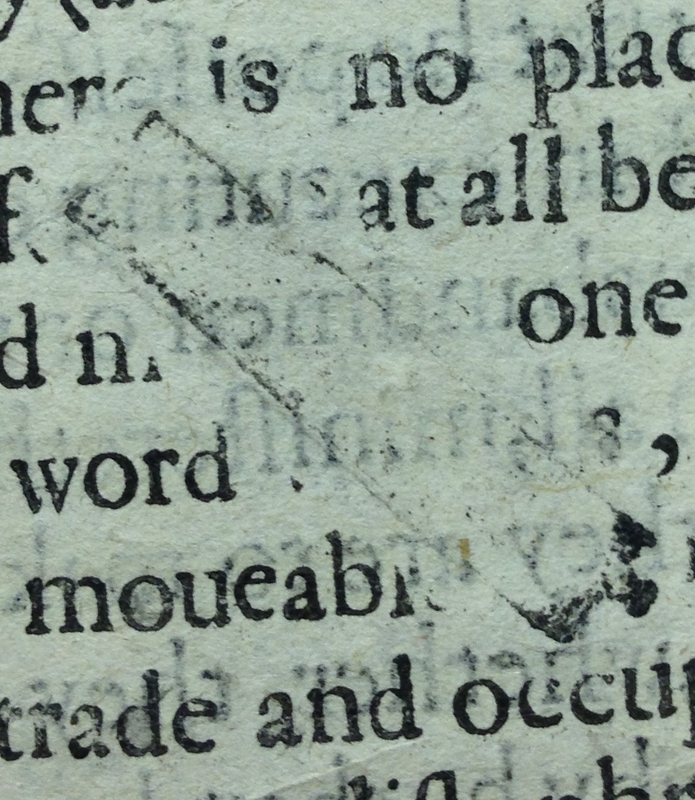 This appears to me to be a stray piece of type that fell across the set page as it was being printed. qui a dû s’échapper lors de la composition ! It’s too long to be a piece of type. Possibly a spacer of some sort? But what is the little knob on the end? And what caused it to come loose like that? The height of pieces of type was just under one inch (it varied slightly across Europe), so a piece of type lying across several lines of text is entirely feasible. Type could be pulled out of the chase by the action of the ink balls or could just be dropped by carelessness. The small protrusion at the end is presumably the top of the piece of type with its character standing clear of the type body, perhaps a lowercase ‘o’? and I think that the ‘nick’ in the side of the piece of type is visible about one-quarter of the way down the upper edge of the impression shown here. See the diagrams in figure 1 in Harry Carter’s View of Early Typography (Oxford, 1969, reprinted 2002). If it’s a piece of type on its side, could it possibly have gotten stuck and made this impression on more than one sheet, or would it have rattled loose so that this is a unique impression? Thank you for your question. Indeed, the fallen type could have made an impression on more than one sheet although I suspect the printer would have likely noticed the impression when taking the printed sheet off the tympan. The other copies of this book that I have checked in our collections and online did not have the same impression on either page that would have been printed in this forme.